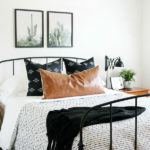 One thing I really love is a quick and easy room refresh, there’s nothing better than adding a few new products to a space and shopping your existing home decor to change things up. This week I visited one of my oldest friends Kim from A Night Owl Blog and helped her freshen up her living room, today I’m sharing her Easy Farmhouse Inspired Decor Living Room Refresh with you. Kim and I have been friends for over 25 years, we have known each other since junior high and we always have the very best time together. When I knew she wanted to switch things up a bit in her living room I asked if I could help her with a quick and easy refresh of the space. This space is part office for Kim since she uses it as her home office and the other half is where her family spends a lot of time hanging out while she works. There wasn’t a lot of decor in this room to begin with other than her desk and a neutral colored sofa. Kim has pretty similar decorating styles to mine and loves neutrals so we stuck with that. 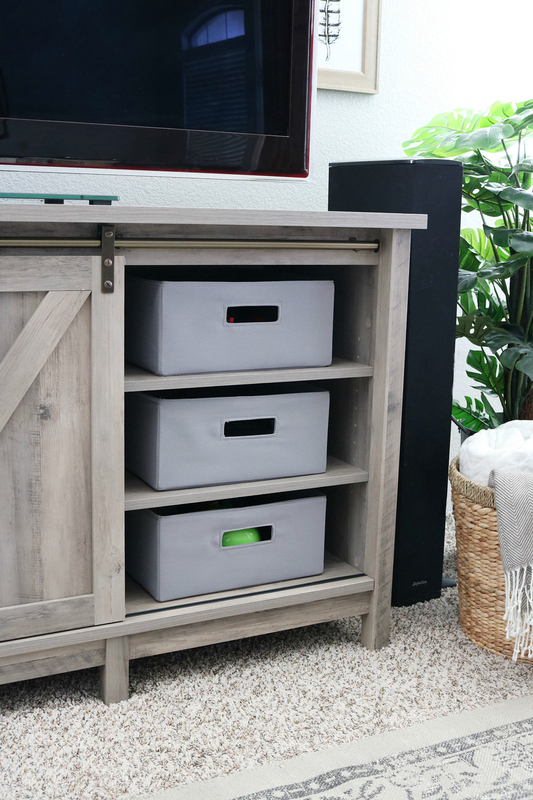 One thing that was a must in this space was a place for the tv, but it needed to allow room for her husband’s tower speakers. 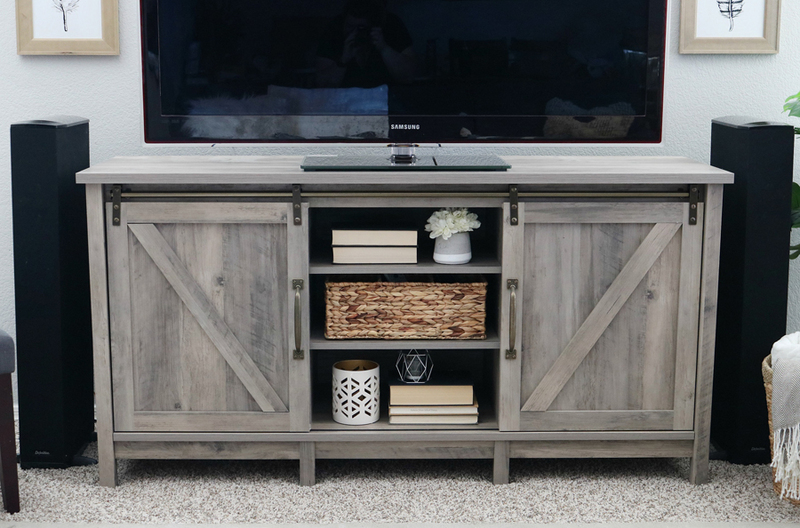 I already knew Kim had been eyeing this Better Homes & Gardens Modern Farmhouse TV Stand and I felt like it was a good fit for her space. It was pretty easy to put together and it’s really such a pretty piece. The color is fantastic and I’m obsessed with the sliding barn doors. 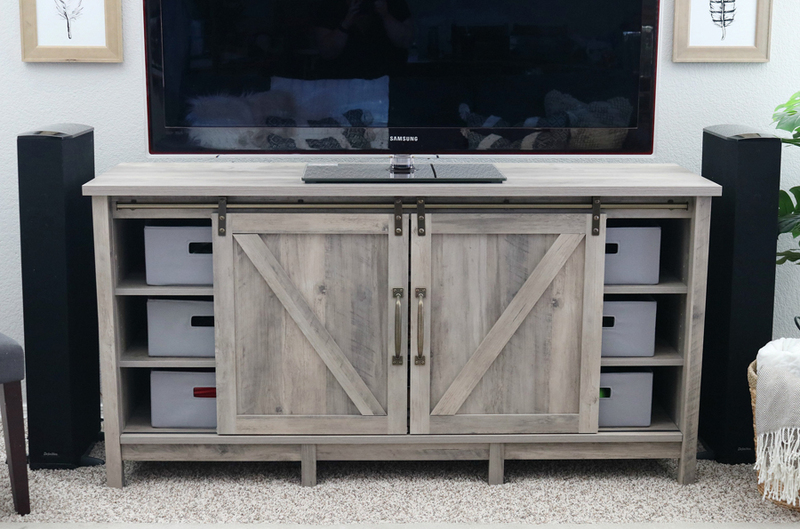 The gray tones of the tv stand went perfectly with her existing wall color and flooring. 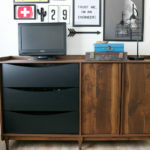 This piece would be so good in an entryway too, it’s pretty versatile. This room needed some storage for her youngest sons toys, he’s two and is in this room a lot when she works so having places to put everything was a must. 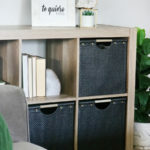 I found these gray Better Homes & Gardens Half-Sized Storage Bins in my local Walmart store, they fit perfectly on the shelves. The sliding barn doors allow the toys to be hidden when they are not being used, but even if the door is open and shows the gray bins it still looks pretty. 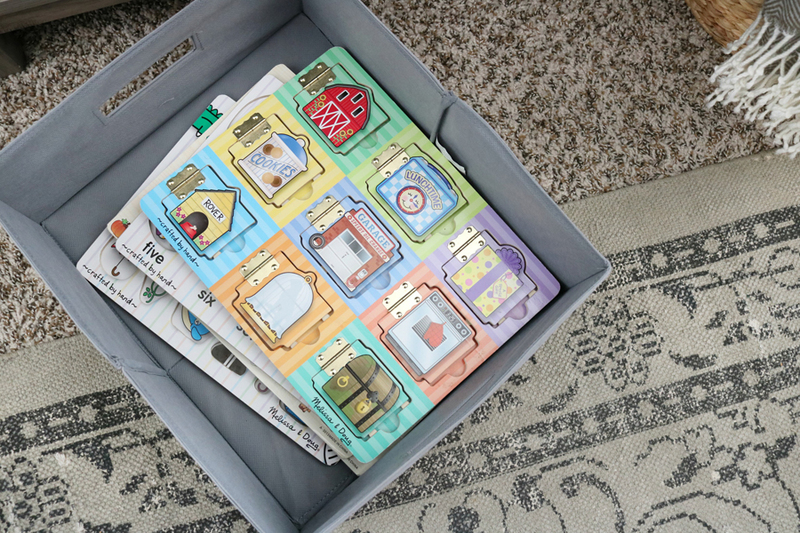 The bins are deep enough too that they offer a good amount of storage for small toys and things like puzzles, books, electronics and more. What I love most about this piece was the center shelving. While it can be used for more kid-friendly storage in Kim’s space with more baskets or bins, I wanted her to have decor that would make the space feel a little more decorated when the barn doors were hiding the toy storage. The shelves are all adjustable so we were able to configure them to the heights we wanted for the decor. We shopped her house and I added some old books, and small accessories like the Better Homes & Gardens White and Gold Ceramic Hurricane, Better Homes & Gardens Silver Wire Tea Light Holder, and a Better Homes & Gardens Woven Tank Basket. The decor is simple and kept with the modern farmhouse feel. 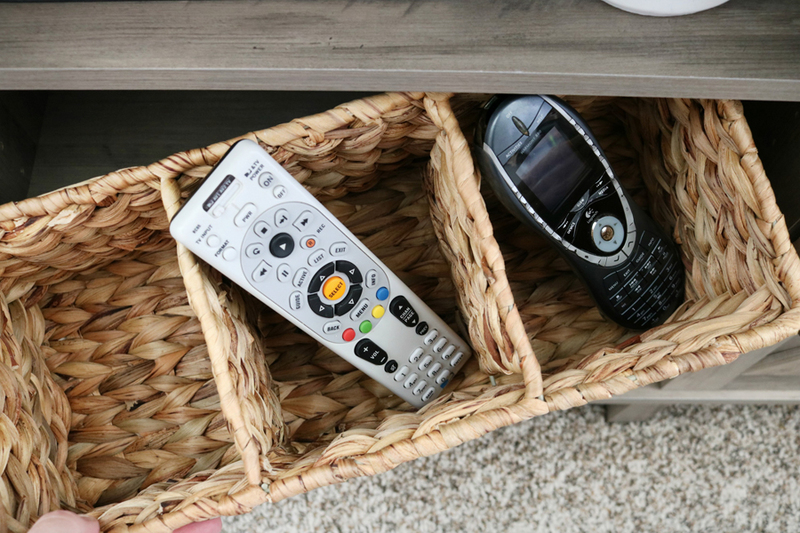 I love the basket on the center shelf, it not only brings texture to the space it’s functional and is perfect for holding remotes. Since we had to work around the tall tower speakers on either side of the tv stand I wanted to add some other elements to sort of deflect attention from them. I found this large Better Homes & Gardens Round Hyacinth Twist Handle Basket in my local Walmart store. It’s such a good size, it’s perfect for plants and even better for storage. I love using baskets for storing extra blankets and throws. 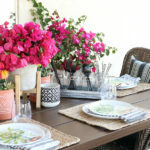 Adding baskets like this also bring a lot of texture to the space. 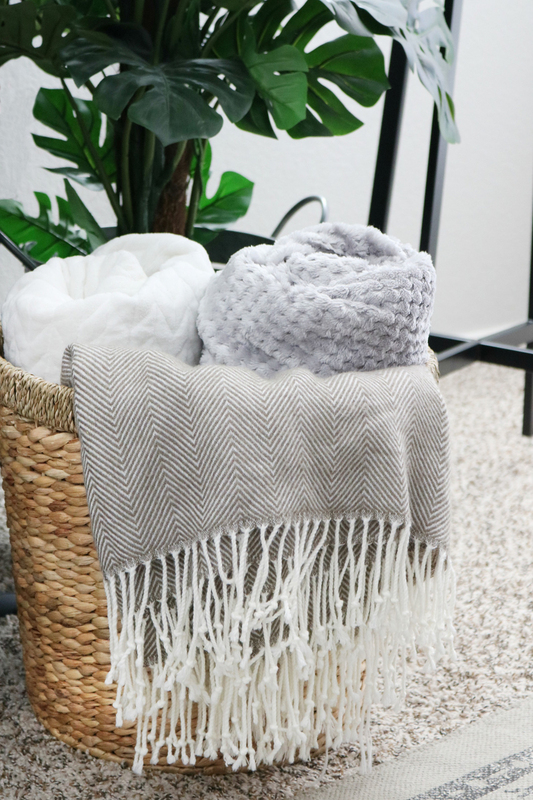 We were able to shop Kim’s house and found a decent sized faux plant to place in an olive bucket type container, we placed the plant behind the basket of throws and it totally helped to hide the speakers a bit. 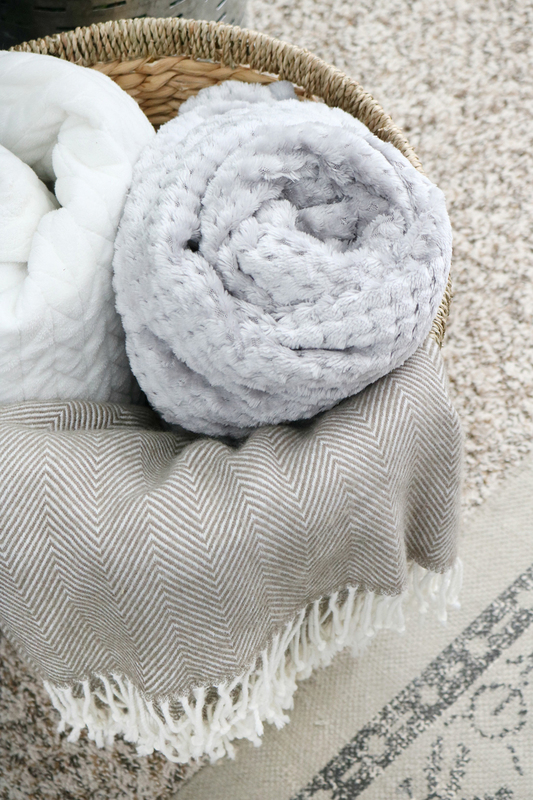 Since you can never have enough throws I found this Better Homes & Gardens Oversize Reversible Velvet Plush Throw and we added it to some of the other throws she had around her house. 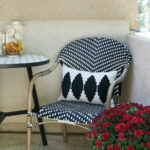 Another quick and easy thing we did to freshen up this space was new throw pillows. 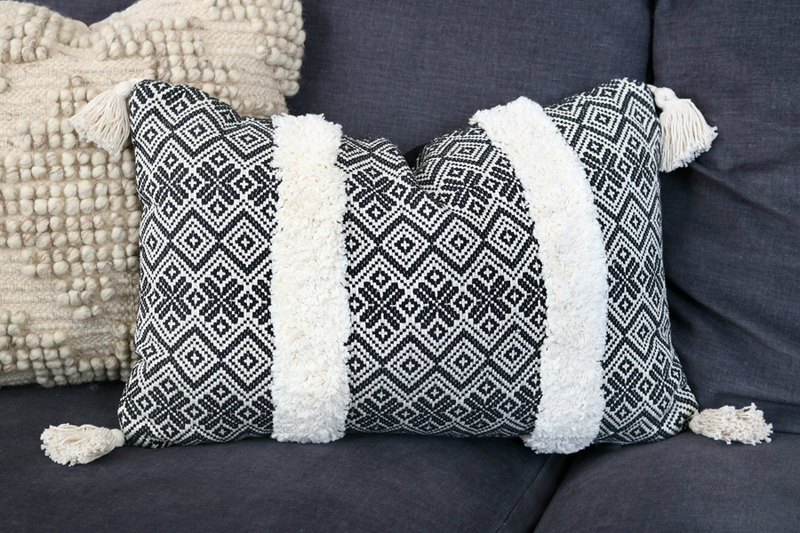 I litterally stumbled across these Better Homes & Gardens throw pillows the other day while shopping at my local Walmart stores and snagged them for her sofa. 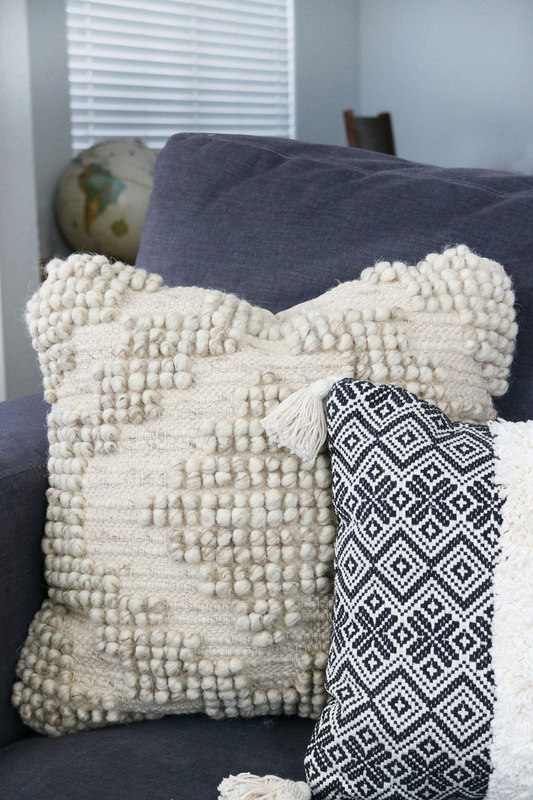 They both have so much texture which is so good against the smooth charcoal gray fabric on her couch. 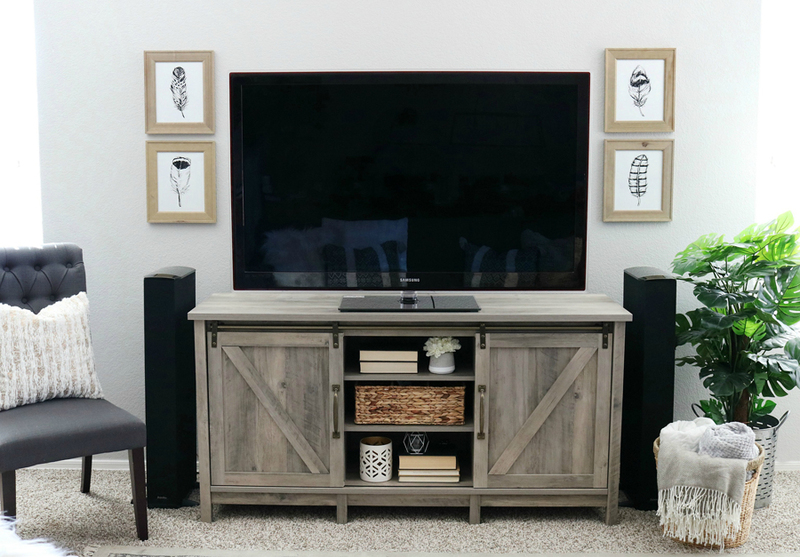 The last thing I added to this Easy Farmhouse Inspired Decor Living Room Refresh was the Better Homes & Gardens 8 x 10″ Rustic Wood Frames. 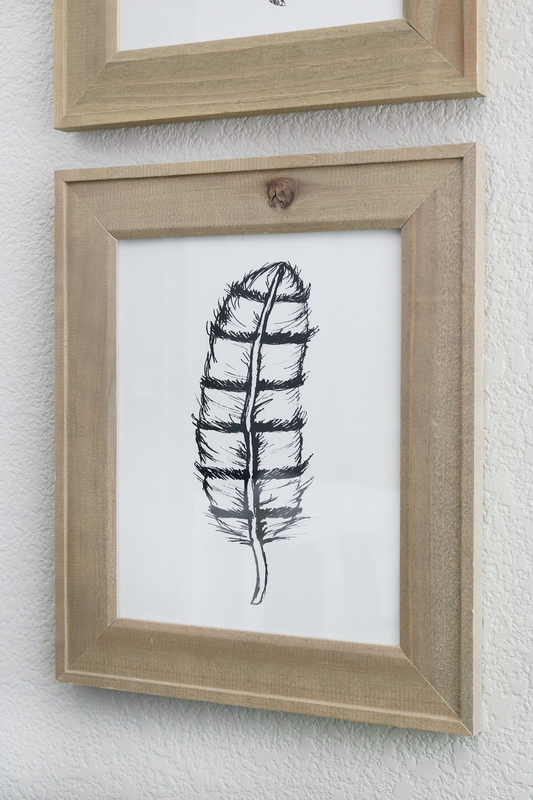 I put simple black and white feather prints inside, you can find the artwork to purchase HERE. I used command velcro strips to hang the frames on the wall, I added two on each side of the tv to help frame it. 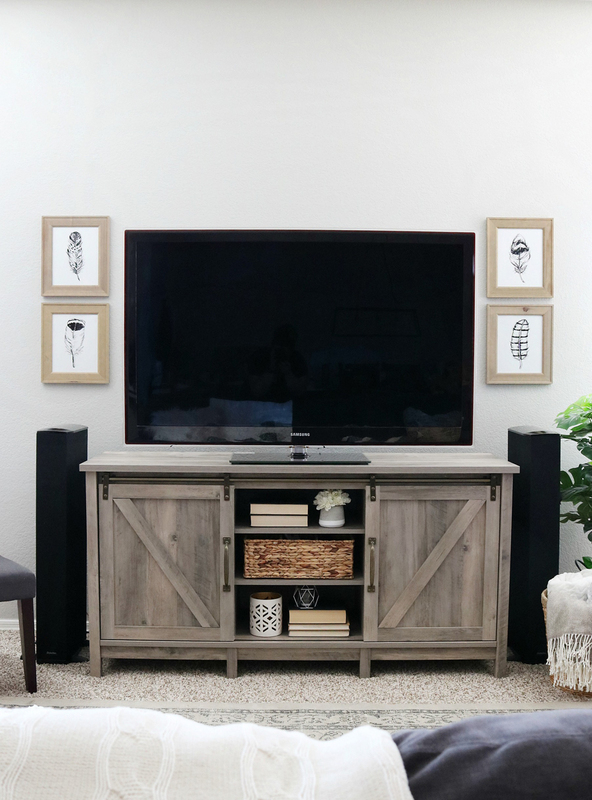 Since Kim has windows on both sides of the tv stand there wasn’t a lot of room to do a full-size gallery wall around the tv, but these frames were the perfect solution to adding some decor to the walls. 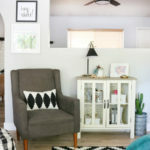 It took about an hour to do this Easy Farmhouse Inspired Decor Living Room Refresh and now it feels cozier and fits the needs that this cute family had for this space. I love that we were able to bring several new pieces to this space and add to existing things from her home like her rug, sofa, chair, plants, and small accessories. She loved how it turned out and so did I. It looks beautiful. I love the tv stand. Thank you! 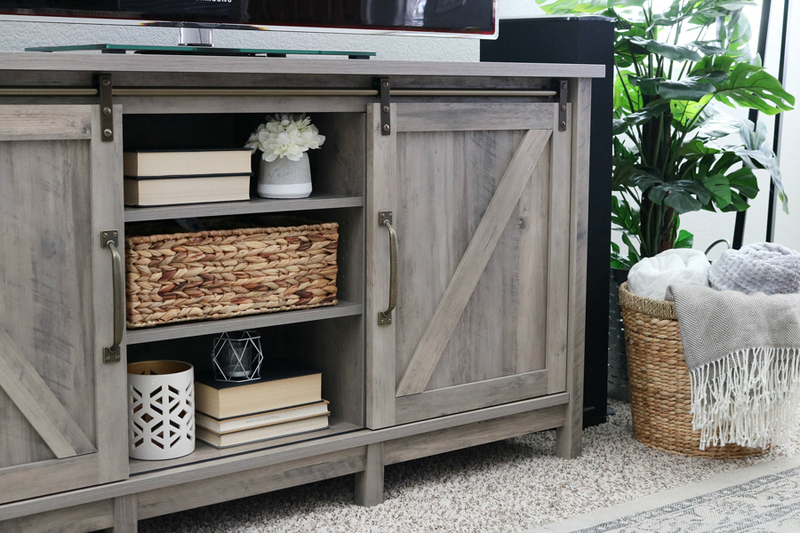 The farmhouse inspired tv stand is so cute isn’t it? !